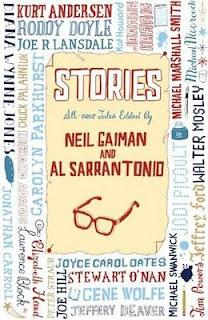 Stories - All New Tales is a collection of short stories edited by Neil Gaiman and Al Sarrantonio. The collection features stories by well known writers like Jodi Picoult, Jeffery Deaver, Joe Hill, Chuck Palahniuk and many more. So they put the word out and writers started submitting their short stories. The stories cover science fiction, fantasy and horror genres, which make for an engrossing collection. 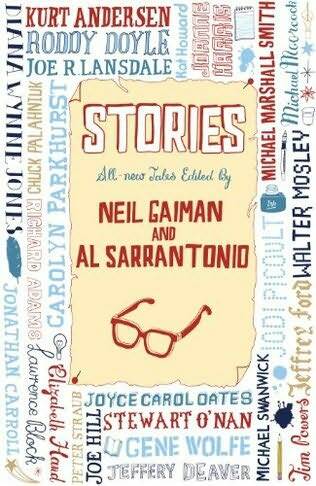 I found it an interesting collection and I enjoyed most of the stories. Weights and Measures by Jodi Picoult made me shed a tear, which hasn't happened while reading a book in many many years, which was enough reason alone to read this collection. The Therapist by Jeffery Deaver was a real thriller with a supernatural theme, and The Cult of the Nose by Al Sarrantonio was creepy and had me wishing for more! I thoroughly enjoyed Human Intelligence by Kurt Andersen, which was about a being from another planet who had been living on earth and documenting our existence for fifteen hundred years before his identity was discovered. However, it was Michael Marshall Smith's Unbelief that had me completely stupefied. The story is only seven pages long, but took me 45 mins to figure it out. When I finally figured it out, it was such a huge relief! I gave it to someone else to read and said: "here, it took me 45 mins to figure this one out, see what you think". Predictably he had it sussed from the first page, argh! It was refreshing to read a collection of short stories in between my regular reading schedule and this is a very fine collection and a terrific way to gain exposure to new authors.